Ms. Namita Nayyar: Tell us about your endeavor on being featured in the music video for Head Crusher, the first single from the Endgame album by the American Metal band Megadeth? Ms. Michelle Waterson: Being on the Megadeth music video was very fun and very short notice. They called me one week and asked me if I would be interested in filming a music video. I am all about seizing the opportunity, so I flew out to LA and learned the fight choreography one night and shoot the next night, then flew back home. it was all very sudden, but I had lots of fun doing it. Ms. Namita Nayyar: You have done bold photo shoots. How you are so body confident and advice to your compatriots? 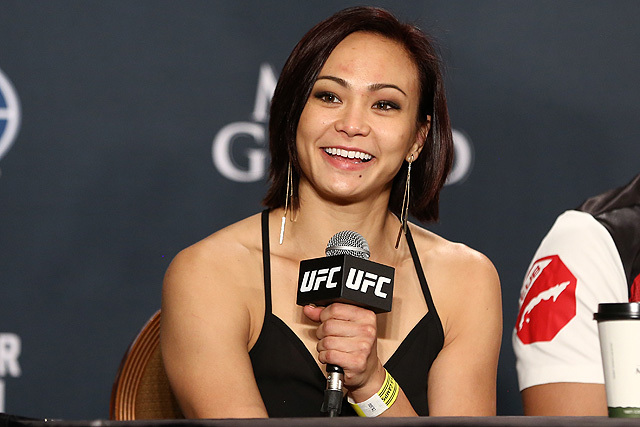 Ms. Michelle Waterson: Be confident in yourself and own it! The human body is beautiful and should be embraced. We work so hard to keep our bodies healthy so be proud when you show it off. Ms. Namita Nayyar: Who has been your greatest influencer and motivator in your success in the field of your career in competitive women mixed martial art fighting? Ms. Michelle Waterson: My teammates Julie Kedzie and Holly Holm. These ladies inspire me in more ways then one. Outside of being amazing people, they carry the spirit of true warriors and I have learned so much from them. I have sweat, bleed, cried and celebrated with these two and I would do anything for them. Julie Kedzie is the original gansta when it comes to WMMA, she has opened so many doors for us ladies, and if it wasn’t for her and many other pioneers of the sport we wouldn’t be where we are today. Holly is so hard on herself and is always pushing to improve something, and I feed off of her drive to make myself better!!! Ms. Michelle Waterson: It’s important for us ladies to empower one another, iron sharpens iron, so don’t be intimidated by competition!!!! Embrace it!!!! Womenfitness.net is a way to get inspired, motivated and healthy! It’s a community where we can grow and become stronger in every aspect of your life. Women Fitness Team thanks Michelle Waterson for giving her valuable time for this interview and quenching the thirst of her fans to know more about her and made this interview happen.